Indulge in a feast of seasonal specialities at the Lord Nelson Restaurant, from summer salads to winter beef wellington. Take time over an afternoon tea layered with tempting sandwiches and sweets. Or go light with delicious poolside snacks at Oasis Bistro. 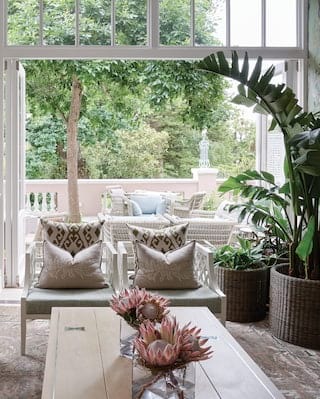 Boasting some of the best restaurants and bars in Cape Town, a stay at Belmond Mount Nelson Hotel is foodie heaven. Dine on daringly modern, seasonal cuisine in one of the hotel's most historic spaces. Rich oak panelling and ornate pressed ceilings are complemented by bright botanical tapestries. The wooden chairs were once used by first class passengers on the Union-Castle Shipping Lines. In contrast, Chef Rudi Liebenberg’s fresh and vibrant menus are avant-garde. The best local ingredients and traditional recipes are transformed into stunning, contemporary dishes. A draw for guests and non-residents alike, Oasis Bistro is perfect for long, lazy breakfasts or invigorating afternoon pick-me-ups.cocktail. During these dates we will be serving à la carte lunch only, from Monday to Friday 12:30 to 3pm. The full lunch buffet will be available on Saturdays and Sundays. Join us for a delicious buffet lunch accompanied by live jazz music. Available each Sunday through 30 April, 12:30 to 3pm. Weekends at Oasis Bistro are always an event to remember. Sunday lunches are even more tantalising. Feast from a carvery station serving roast sirloin of beef, leg of lamb, Beef Wellington, slow cooked salted beef, chicken curry and grilled line-caught fish. The much loved Alvin Dyers Cape Jazz Duo will be there too, playing easy-listening South African jazz classics. Head to the Lord Nelson Restaurant and anticipate a night of culinary and musical excellence. Soprano and pianist Lisa Engelbrecht joins mezzo soprano Lindsay Thomson form Classic duo ‘The Opera Angels’. On select evenings they will perform for diners. Anticipate a fantastic repertoire, ranging from opera arias and classic European art songs to Broadway hits and contemporary favourites. Priced at R650 per person, including a welcome glass of Boschendal Brut MCC and a three-course dinner. Concerts held on 6 April, and 8, 15, 22 and 29 June. A special concert with the Cape Opera Ensemble will be held on 27 July. Embrace tradition with an elegant afternoon tea. Finger sandwiches are filled with rare roast beef, delicate smoked salmon or creamy egg mayonnaise. Follow with velvety chocolate cake, lemon meringue or freshly-baked scones topped with preserves and cream. Looking for something a little different? 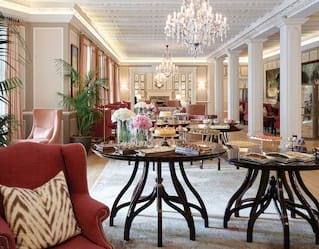 Our beautiful lounge also offers a choice of à la carte dining options throughout the day. Nothing we do is rehearsed. Guests can look forward to a true, raw, organic experience. Step into the hotel’s kitchen to watch in wonder as dishes are prepared right before your eyes—then uncover the inspiration behind each creation. Menus change daily according to the seasonal ingredients available locally. Cool, chic, yet timelessly elegant, Planet Bar buzzes year round with well-heeled Capetonians sipping sundowners or pre-dinner champagne. The bar’s stylish celestial décor and cosy seating create an intimate ambience. Whether you’re people watching from the terrace in summer or curling up by the fire with a glass of red in winter, this is the place to be. Open: Daily, from noon until late. Whether it's an anniversary, a birthday or just “because”, escape to Belmond Mount Nelson Hotel for an indulgent break. With a wide range of beautifully restored venues, historic Belmond Mount Nelson Hotel sets the scene for a memorable event. Our gardens are ideal for lavish weddings; our cellar for cosy gatherings; or the Chef's Table for group feasts.